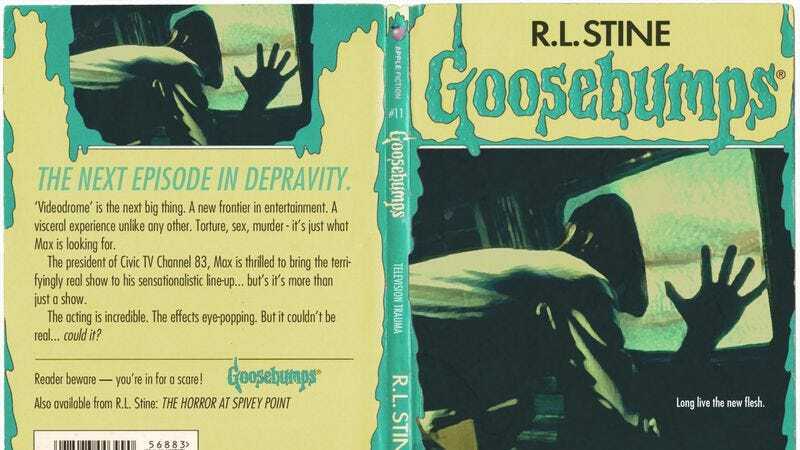 For a generation of kids, the Goosebumps series of books was a gateway into the horror genre. Taking well-worn features of scary movies and stories (living ventriloquists, zombies, plant monsters replacing people), author R.L. Stine was able to repackage them into more acceptable fare for younger readers while still maintaining some of their fear-inducing elements. And now, over on their Tumblr site, If It Were Stine, Theodore Holmstead-Scott and Jude Deluca have gone the next logical step by literally repackaging popular horror franchises as Goosebumps titles. Holmstead-Scott and Deluca have put a lot of effort into reimagining these more adult titles, updating them for those same horror kids that have grown up on these scarefests. The books are not directly named after the films, but instead have a quaint Stine-ian simplicity to them. Furthermore, the back cover text reads uncannily like the prose used to entice many child readers decades ago. The duo has selected a multitude of titles from the more obvious (A Nightmare on Elm Street, Friday The 13th) to the fairly obscure (Beyond The Black Rainbow, Prom Night II). They have even branched out into television with titles covering American Horror Story and The Walking Dead. There are some highlights below, but check out the full selection over at their site.